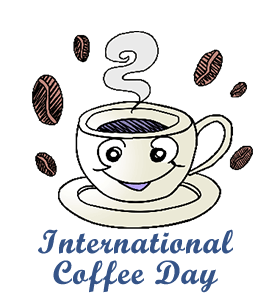 ﻿International Coffee Day: Calendar, History, Tweets, Facts, Quotes & Activities. International Coffee Day seeks to celebrate coffee from around the world while honoring the farmers, traders, roasters and baristas responsible for creating the coffees that are enjoyed by so many people worldwide. According to an Ethiopian legend, coffee, a black bean enclosed in red berry, was discovered by a goat herder in the Ethiopian highlands when he noticed that his goats had become overly energetic after eating the berries. Slowly, the herder's discovery spread throughout the Arabian Peninsula, into Europe and finally to the New World, increasing the demand for coffee and making it the second most sought after commodity in the world today (crude oil being the first). Organized by the International Coffee Organization and its 75 Member States, International Coffee Day was first celebrated on October 1, 2015 in Milan, Italy at Expo 2015. The International Coffee Organization is an intergovernmental organization that unifies coffee exporting and importing governments through international cooperation with the aim of creating a sustainable coffee market and lowering poverty levels in developing countries that harvest coffee. Kopi Luwak is one of the most expensive coffees brewed in the world. Kopi Luwak it is made with digested coffee beans that had been eaten and defecated by an Asian toddy cat (Asian palm civet). This rare coffee can cost between $35-80 US dollars for a single cup. Long-term caffeine intake can lead to a caffeine addiction/dependence, which has been medically recognized as a disorder. When individuals with a caffeine addiction abstain from caffeine, they may experience withdrawal symptoms including headache, fatigue, difficulty concentrating and mood changes. According to the Coffee Organization, 143 million 60kg bags of coffee were produced in 2015 and Brazil was the leading exporter of coffee, with more than 18,953 60kg bags of coffee exported between August 2015 and January 2016. Get free coffee! Starbucks and other coffee chains offer free coffee on this day! Grab a cup of America's favorite best-selling coffee. According to Howard Telford, market researcher at Euromonitor, the nation's best-selling brand of coffee is Keurig, followed by Folgers, Starbucks, Maxwell House then Dunkin' Donuts. Try some American-Grown Kona coffee. Harvested in Hawaii, Kona coffee is grown on the volcanic soil of Mauna Loa Volcano, which is an active volcano! Medium-bodied, Kona coffee is also one of the most expensive coffees in the world.